Why would I want Linux? Linux doesn’t spy on you, and it’s not run by corporate interests, so you can be confident that it never will. Sure, you can turn off some of the spying in Windows, but wouldn’t it be better if there was no spying in the first place? Linux is very customizable – you can change it to suit your preferences and truly make it your own. Here’s a screenshot of my Cinnamon desktop now. 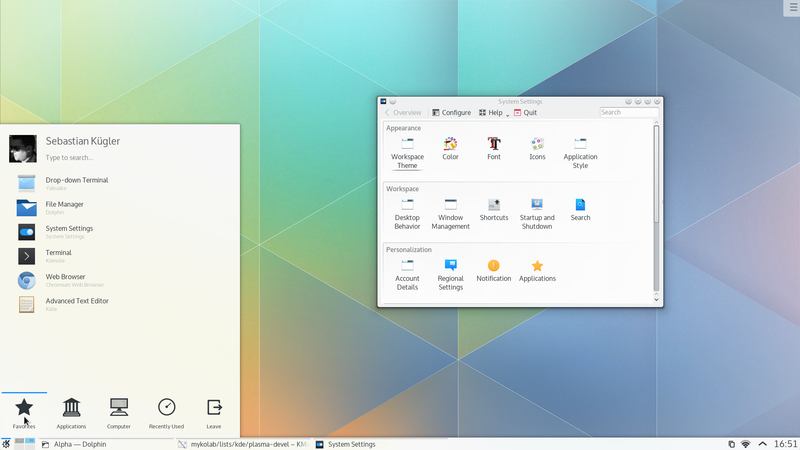 Here’s a few more looks you could go for: Gnome 3, KDE Plasma 5, and more. It’s free. No need to drop $100 on a Windows license for your next build. It’s also free as in “freedom” – a lot of people take this too seriously, but it just means that you can do whatever you want with it. When Microsoft made the full screen start menu and you bitched about it, you couldn’t change it. On Linux, you can. If you’re a programmer, the source code for nearly everything you use is available to you as well. Working on your PC is a hobby. Building it from scratch is part of the fun of being in the PC master race. Why stop at the hardware, though? With Linux, you can use the out of the box system and be happy, but if you want you can also tweak it and customize it and build it into a very personal experience. Easier to install software. On Windows, you google it, download an installer, run it, put in your password, click “next” 10 times (carefully avoiding the toolbar option), and then you have it. On Linux, you enter one command on the terminal, put in your password, and then you have it. There are also graphical tools that you can search for software, press a button, put in your password, and then you have it. Ask me this question five years ago, and I would have told you that you’d be giving up games if you switched to Linux. Thankfully, though, that’s not true today. 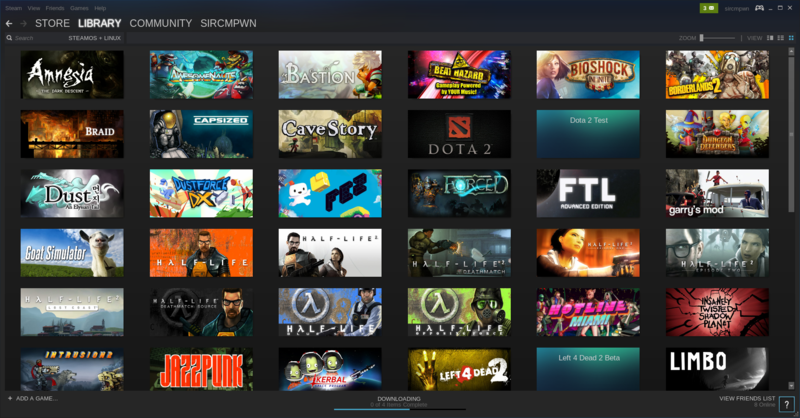 Here’s my own steam library: one, two. 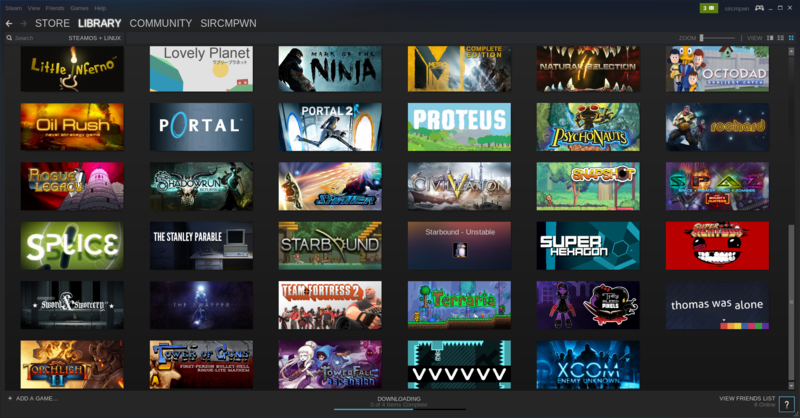 There are many more games on Linux that I don’t have, too. On top of that, I’m able to play a lot of games with wine, which is software for Linux that lets you run many Windows programs. However, I’d be lying to you if I said you wouldn’t be giving up some games. Most AAA games are unfortunately not ported to Linux until months or years after they’re released, and new games won’t work in wine until wine catches up with Windows. The solution many people turn to is called dual booting – it’s very easy to have both Linux and Windows installed on the same computer, and switching between them is as easy as rebooting. But are games on Linux slower? This depends on the developers of the game in question. Linux provides OpenGL, which fills a similar niche to DirectX on Windows. OpenGL runs on more platforms – Windows, Linux, Mac, and more, so many games for WIndows are actually using OpenGL. The performance of both frameworks is comparable – Valve, for example, was able to squeeze more performance out of Left 4 Dead with OpenGL on Linux than with DirectX on Windows. On the other hand, PCSX2 (a PS2 emulator) has poorer performance on OpenGL when compared to the DirectX frontend. On even an entry level rig, though, you can expect to have a good time. You are not likely to notice any difference in performance between Windows and Linux. What’s this terminal thing? I’m scared of text! A lot of people think that Linux users live in a terminal, just entering commands to get everything done. This is actually true, but it’s not a bad thing. On Windows, you are used to doing everything by clicking buttons on windows, and the command prompt on Windows is pretty bad. I can understand how Windows users would think that Linux users are crazy for preferring a terminal. But on Linux, the terminal is generally the fastest and easiest way to do whatever you’re trying to do. You can do things the Windows way, with GUIs and buttons and text boxes, but most users end up liking it just because it gives you that extra speed and flexibility. Consider this – on Windows, let’s say you want to install some software. You pull up Chrome, google for the software, click the first link that isn’t an ad (and there will be an ad), download it, double click the installer, put in your admin password, click “next” several times (carefully avoiding the ask toolbar), and then you have it installed. On Linux, you install Firefox by typing sudo apt-get install firefox into a terminal, providing your admin password, and now you have Firefox. It really is easier, and that’s the only reason people gravitate to it on Linux. I heard stuff about Linux and Unix, what are the differences between them? Unix is an operating system created by Bell Labs in the 70’s. It defines a certain way an operating system should behave, and Linux is a free implementation of that behaviour. OS X is another implementation of Unix. For this reason, Linux and OS X are (for the most part) compatible. Windows is another operating system that is not an implementation of Unix, and programmers have to make a special version of their software to run on Windows. What’s up with all these different kinds of Linux? You’ve probably heard of various Linux distributions, or “distros”, like Ubuntu, Fedora, Arch Linux, Linux Mint, and so on. It seems complicated, but it’s actually very simple. “Linux” itself just provides the core functionality of the system, things that the user can’t really see, and the distro provides the look and feel, default applications, and a handful of other things. It’s like this – imagine that a car company built a really good engine, and then gave it away for free. A whole bunch of people made their own cars, built around this engine. They might look different, have different wheels and seats, but they’re all cars, and they have this one engine design in common. That’s how Linux works – Linux is the engine, and the distros are the rest of the car. For newbies, I suggest you google these three, and pick whichever one you think is prettiest: Fedora, Linux Mint, Ubuntu. Moderately advanced users might use distros like Debian or Antergos. Experienced users often prefer Arch Linux, Gentoo, or even Linux from Scratch. How does Linux avoid malware? On Linux, you used a command like sudo apt-get install firefox. This command uses a list of software supported by your chosen distro (this is a very long list, and includes most of the software you could ever want). This time, the software you’re installing was packaged by people you trust (not a business just looking for a quick buck), is guaranteed not to have shovelware like that toolbar, and comes from one place and one place only. If you stick to installing software this way, it is very difficult for you to get a virus. This breaks down if you leave the comfort zone of what your distro provides. If you find some software that you want to install that your distro does not support, you have to install it yourself. This means that you are now responsible for validating that it came from the right place, doesn’t spy on you, doesn’t include malware, and so on. You won’t find yourself in this situation often. Very easy. The installer will walk you through the process, handle things like dual booting for you, and it’ll only take a few minutes. ‹ PreviousHow to: Get rid off Microsoft’s OneDrive with one file. The problem is not switching. It’s actually that some app that I need to use in windows aren’t compatible (even with Wine). That’s a shame because in the end, I truly believe that Linux IS the future, particularly if you think that we’ve been spyed since late 90s. With SteamOS something is moving, let’s hope for a (good) change.